It seems like the only cheap eats you can get in the burbs is fast food or some kind of chain. Those are not what I would consider good food. Cheap yes, but not good. I want Cheap Eats that are really good. We started an order right away. One thing you should know about these so called “balls”, there are actually no balls involved. 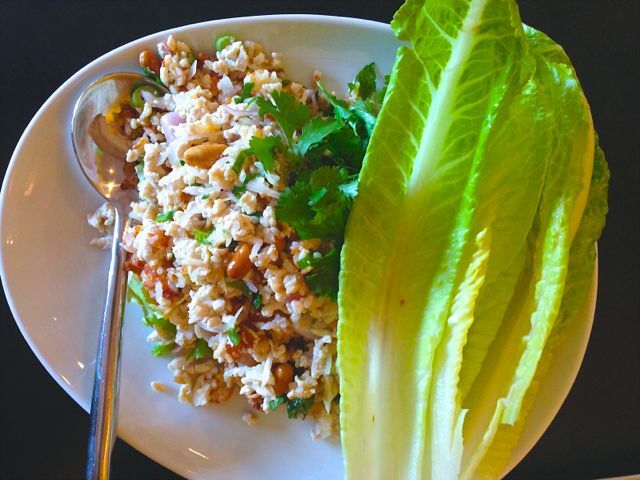 It’s just a big plate of Crispy Jasmine rice mixed with your choice of ground chicken or deep fried tofu, cilantro, green onions, roasted peanuts, shallots, and lime juice. 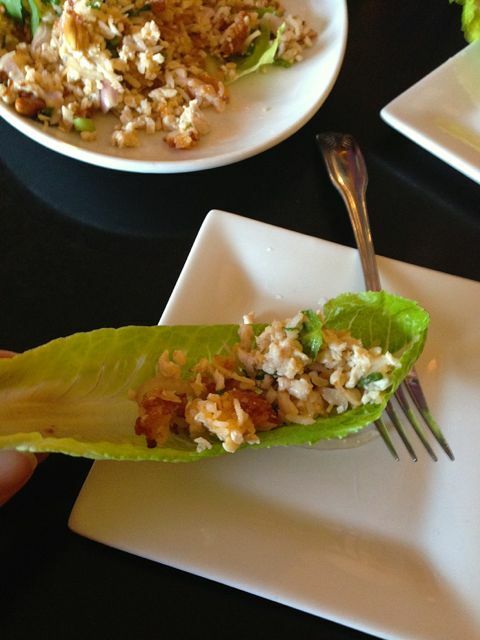 It’s spread out on the plate and served with lettuce leaves to eat it with. I don’t care where you live, you need to drive to Sherwood for some balls, that aren’t actually balls. It’s a large serving, enough for an entire meal, and it’s only $8.50. We also ordered the Hot Spicy Noodles, which is fresh wide rice noodles stir-fried with choice of meat, broccoli, mushrooms, zucchini, onions, bell peppers, carrots, and chili paste. This dish was also delicious, but my only complaint is that it wasn’t spicy enough. I should have had them kick it up a notch. I love that it’s mixed with tons of veggies. This dish is also just $8.50. That made our Cheap Eats in the burbs just $19 for the 2 of us. It was fresh and loaded with flavor. Plus their menu is so large and many items are below $10. 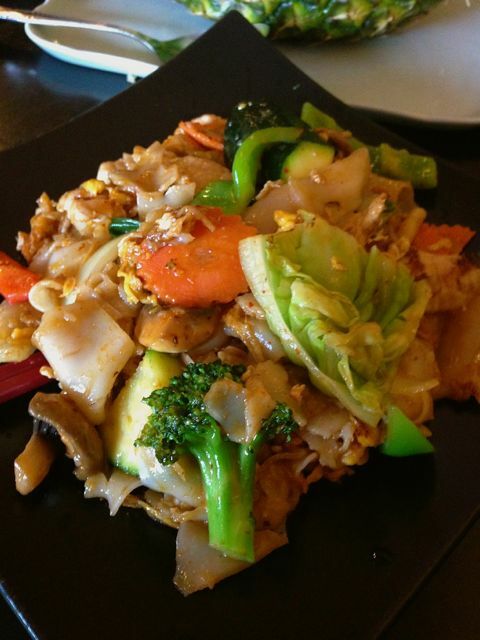 If you would like to get it even cheaper then stop for lunch where dishes start at $7. Here’s a lunch review of this place. Atmosphere is a typical strip mall Thai joint. This place is always clean and always busy. We have even had to wait for a table before. Service is always, always great here. I’m sure it’s because it’s small, you can easily flag someone down, but you rarely need to as they stay on top of everything. Pricing is very affordable. Lunch entrees start at $7 and dinner entrees average around $8-$9, although they do have some more expensive dishes if you wish. They do have Thai iced tea and they have their own version of Thai Iced tea. I have not tried it, but have seen it on the menu. They do not serve alcohol.